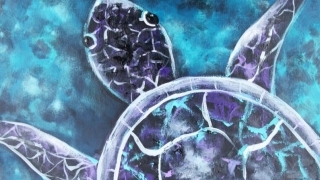 Join Lily as you create a fantastic Turtle painting. We start painting the background on a 16x20” canvas. Lily will help you to choose your own color palette that will work with your own home decor. Guests will enjoy a delicious Bento Box during the break across from the beautiful 12 Mile Creek! Lily will choose a Bento box for the group based on your food restrictions. We then go back to the classroom to finish the rest of the painting for you to bring home! Please pay upon arrival at the event. $45 per guest cash with tax included. We do not accept Debit. We accept credit cards with extra processing fees. It is OK to cancel just let Lily know ASAP. The event will be cancelled if we cannot get enough guests so please share this event with your friends!